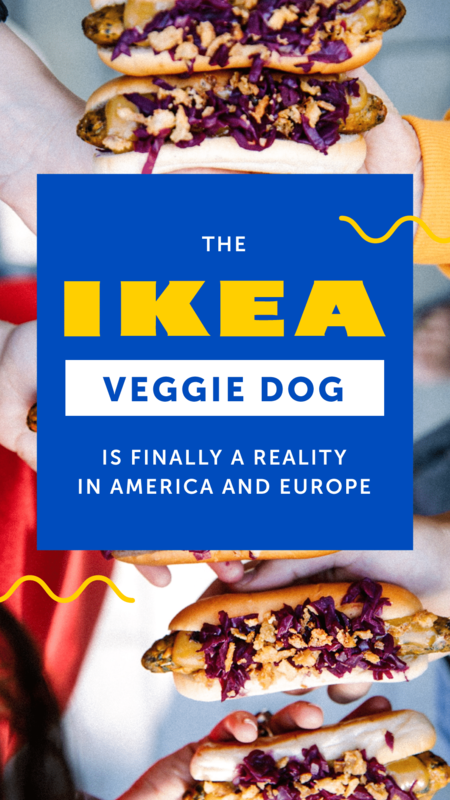 The IKEA veggie dog is finally available in the USA and Europe! Earlier this year famed home goods retailer IKEA announced that it would add more vegan offerings to its in-store menu. And that day has finally come. The company will officially launch its much-anticipated new veggie dog on September 25—at all American and European locations! Ikea claims its new veggie hot dog has approximately seven times less Co2 emissions/kg than its standard version. The carbon footprint of the hot dog made from meat is 6.38 kgCO2eq/kg, while the veggie hot dog has a carbon footprint of 1.02 kgCO2eq/kg. But these veggie hot dogs aren’t the only plant-based menu item coming to stores. The company also plans to introduce a vegan soft serve in summer of 2019. While the recipe is still in the works, it will likely be made with soy, oats, or fruit. Plus, there are already tons of vegan options available at IKEA, including Grönsaksbullara, a vegan version of its classic Swedish meatballs. Made with chickpeas, green peas, kale, corn, and peppers, this is one of the first vegan offerings from IKEA, which was added to the menu in 2015 with much fanfare. Here are our favorite vegan options at IKEA. As more people discover the vast cruelty inherent in animal agriculture, the popularity of vegan food will only continue to grow. From savory new options popping up at restaurants and retailers to the rising number of all-vegan eateries, there’s never been a better time to ditch cruel animal products. For delicious vegan recipes, easy meal ideas, and tips on making the switch to a plant-based diet, order a FREE Vegetarian Starter Guide today.